Recently, though, I visited a colleague who works at a church by the beach. I enjoy the beach and I would approve of Jesus moving us there. Not only does my colleague get to work near the beach, but he also has an amazing view from his office. He can see the ocean from his desk, the sun shining off the Pacific. We don’t even have any windows in our office, much less a view of the ocean. While I love my job and I am more than happy to work at my church, I wouldn’t mind one of these nerdy offices. While more of a conference room than an office, I still wouldn’t mind hanging out in the High Council Chamber. The High Council Chamber is where the Jedi Masters convene for their meetings. I sit in a lot of meetings throughout my week but none of them take place high above a bustling city. I already have a hard enough time paying attention in meetings; I can’t imagine cars and starships zooming by would help. It’d also be difficult to focus with all of the clone troopers shooting and younglings dying. For seven seasons and one movie I watched Captain Picard hang out in his ready room. It was a sparsely decorated office, with a desk, a few chairs and a couch. It didn’t have large extravagant windows, just one that Picard could stare out of when he was feeling pensive. 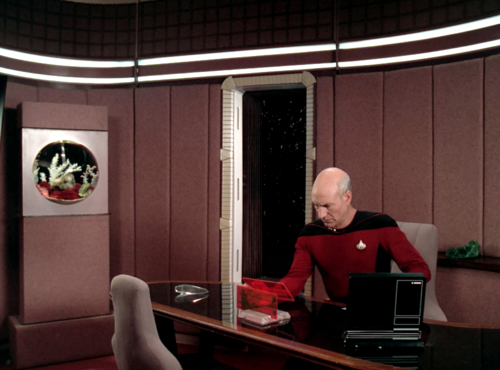 My favorite part about Picard’s ready room was definitely his pet fish, Livingston. A lionfish is the perfect pet for Picard. He doesn’t have to pet it, hold it or rub its tummy. Picard is aloof and distant, which is exactly the type of person who should own a fish. I would love to have an office in the city or in space. Angel’s Aerie offers a different environment. 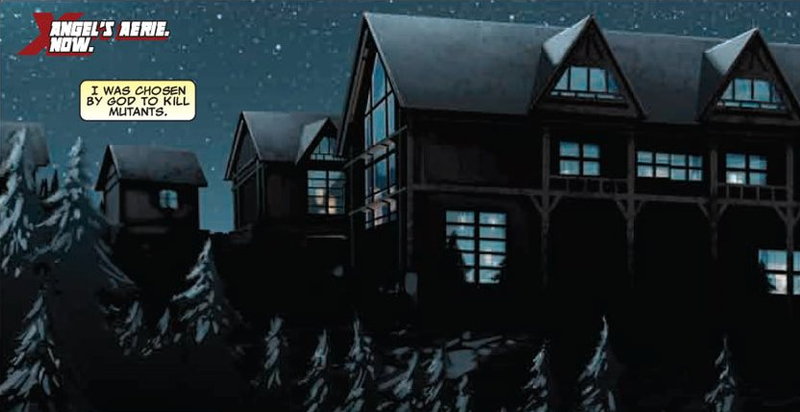 Angel’s Aerie is home to X-Force, Cyclops’s black ops team. Angel’s Aerie is nestled in the Rocky Mountains in Colorado. I’ve been to Colorado once and really enjoyed it. It’s very pretty, very green and I saw a moose. An office in Angel’s Aerie would definitely have tremendous views of the Rocky Mountains, with all of their flora and fauna. Unfortunately it wouldn’t be a very safe working environment, as the X-Men and X-Force always seem to have an enemy at their gates. It’d be difficult to get any work done with Sentinels and the Brotherhood of Evil Mutants always knocking at the door. Coruscant. Space. The Rocky Mountains. The beach. I wouldn’t mind an office in any of those settings. At this point, though, I’m happy with where God has called me. My office may not have any windows or a tremendous view, but it’s where God wants me to be. Maybe someday he’ll want me to be at the beach…or space. What nerdy office would you like to work from? The Ready Room is cool, but I'd love to work on the Enterprise's bridge. Any Enterprise's bridge, but especially the 1701 refit.